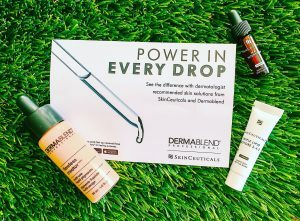 We received complimentary products from Dermablend and SkinCeuticals to test and write a review about our experience with the products. Please note that I am not receiving any compensation to try out these products or for this review. My opinions are not sponsored in any way and I am giving you an honest, descriptive review. SkinCeuticals Hyaluronic Acid Intensifier is a corrective serum that amplifies the skin hyaluronic acid levels which will make it look more vibrant. This substance is naturally present in our bodies and is typically applied to the skin via medicines and moisturizers to prevent the effects of aging. SkinCeuticals Triple Lipid Restore 2:4:2 is a cream that should be applied after the Hyaluronic Acid Intensifier that will nourish your skin giving it a visible appearance of radiance and smoothness. Dermablend flawless creator is a multi-use liquid makeup pigments (or foundation drops) that are blendable, buildable, and customizable. It’s a water-free, oil-free foundation that has less than 9 ingredients. You can wear it alone or to mix with skin care to create a customized foundation finish. It is dermatologist approved which means that anyone can wear it. 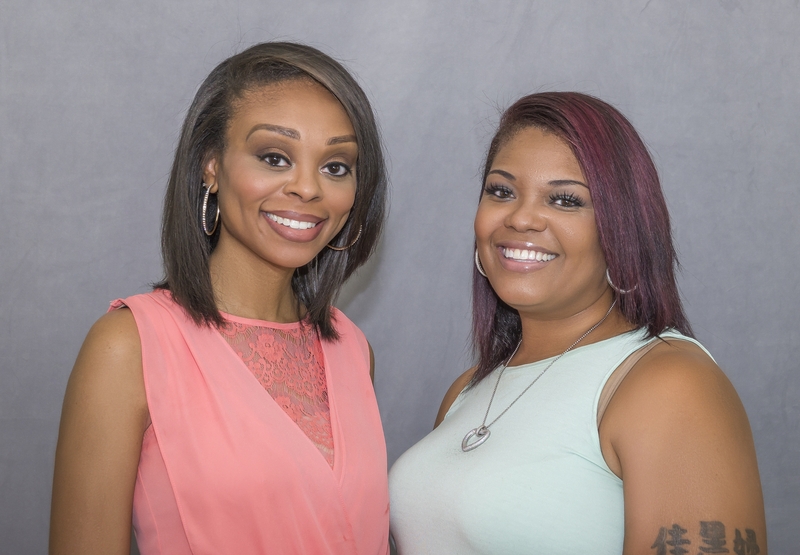 We were sent Dermablend flawless creator muli-use liquid pigments (aka foundation) in the color 45c. I had intended to apply it as a wear alone foundation but couldn’t based on what happened. First, I prepped my skin as usual with my primer by Mac Prep + Prime. 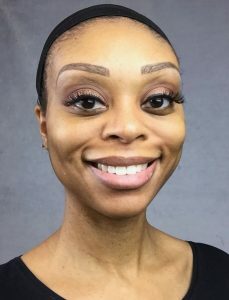 Next, because I usually get shiny in my t-zone and cheeks I applied a powder as I usually do when applying a foundation to my face which I learned from Aunt Jackie (Jackie Aina). I find that this step helps to keep my skin from being too oily in the day. 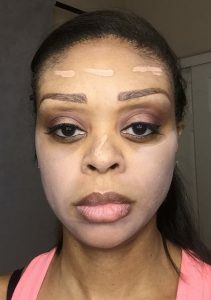 I applied the Dermablend foundation to my face by taking the wand and swiping it in four areas of my face (forehead, cheeks, chin) and then I took a foundation brush to buff it out. So when I began buffing it out on my face I was immediately concerned because it created a white cast on my skin. At that point it was very apparent that the color wouldn’t work alone as it was too pasty in color for my skin. I took a beauty blender, dampened it and tried to blend that foundation out which helped a bit but you could still see that the foundation was too light for me (and yes, I was a little salty). My appearance after using the beauty blender on Dermablend 45c. I figured at that point maybe I could add some contour to help bring life back. The contour helped but in the areas where I do not contour you could still see that ash-like appearance on my face. I was discouraged and I wiped the makeup off an hour later and I did notice my skin felt rough and pasty-like. I removed the makeup with Garnier Micellar Cleansing water and my face felt as if it was chaffed afterwards but luckily I did not see any redness. 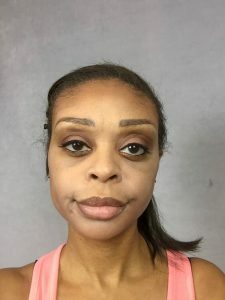 I had no way of contacting the brand back so I decided to give my friend, Diana Anghelus (www.makeupbydiana.com) who is a professional makeup artist a call to see if she had any pointers on how I could make this work.I showed her some pictures and she suggested the steps that I took next. I put H.A. Intensifier by Skinceuticals onto my skin and felt a mild tingle. I didn’t notice much of a change of texture of my face except it felt as if I had put something that was sticky onto my face. I applied the Triple Lipid Restore 2:4:2 next and my skin felt silky smooth. I took my friend Diana’s suggestion and I decided to mix the Dermablend pigments with a foundation that I already owned. I have MAC’s Studio Fix Fluid in the shade NC45 which I tend not to wear because I find that it makes my skin look orange. I figured mixing the two foundations that perhaps I would come closer to my true color (or at least I was hoping). I mixed the two foundations together but I could still that the Dermablend shade was still very prominent so I added a little more NC45 which looked a lot better. I kept dabbing a wet Beauty Blender to get the color just right and finally started looking normal. I was still concerned it was too light so I proceeded to conceal, contour and highlight with the Fenty Beauty by Rhianna Match Stix Trio. Normally, the conceal stick of this brand is a little too close to my skin color but I figured as I was trying to tone down the lightness of the Dermablend that this shade by Fenty Beauty was going to be perfect. P.S. I have listed all the products I used to achieve this look at the bottom of the page. My overall thoughts on this product…I am really on the fence about this product. I searched online to see what I could find out about the colors available and if this was indeed the closest color to my skin. 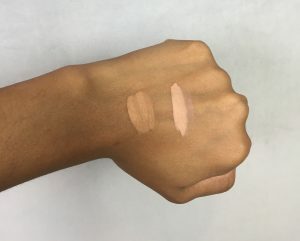 Based on the shades that were on the Dermablend website, there could be two other colors that may have matched closer (or not) to my skin tone. I did see that this brand has a shade match guarantee so I wouldn’t let my experience stop you from experimenting with this brand. Dermablend pigments will cost you $40 for 30 ml (1.0 fl ounces) which is somewhere in-between your drugstore brands foundations and some high end brands. Also if you are person of color it would probably be best to order directly from the company’s website as there are more selections there than your local beauty retailer. I would say if you have sensitive skin this might be a go to product as it only has eight ingredients. However, for myself I would need to keep in mind that if I may have to buy two foundations to mix together to find my shade which could be a little costly. However, if you have a tendency to break out wearing makeup or have oily skin then this brand could work well for you. My rating of 2.5 stars out of 5 for the Dermablend Flawless Creator Foundation drops. Therefore, I gave Dermablend Flawless Creator Foundation drops a 2.5 (out of 5) star rating. Sorry, I feel horrible as I really wanted to like the product but I am just being honest. I have a great responsibility to the readers of our page to be truthful. 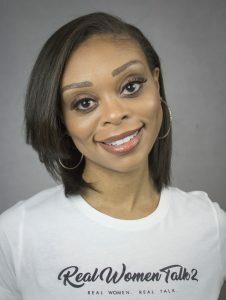 It makes it especially hard to recommend a product to my readers that may look like me who spend $7.5 billion annually on makeup and they will either have difficulty finding their shade or have to spend more to mix two colors to get close to their shade. Now that we live in a Fenty Beauty world I believe a lot of women of color will overlook the benefits of this being dermatological approved and go right over to a brand like Fenty (or NARS and MAC Cosmetics) that provides more range in colors. I gave the SkinCeuticals Hyaluronic Acid Intensifier & Triple Lipid Restore 2:4:2 a five star rating! Fantastic review. Thanks for taking the time to write it. Pretty! 🙂 Do you have a youtube channel so I can subscribe? I am not sure though if the product is already here in PH. You definitely did your due diligence in reviewing this product. Which is not something we can say a lot these days in the makeup world. That said, I agree that folks are probably going to skip over a prouduct that makes them work in this hard in a world where *some* makeup lines are putting in the hard work instead. Your honesty is refreshing and very much appreciated! Thanks for sharing so much in-depth detail! Great review! This is how your readers know you’re real. Thanks for sharing your honest opinions. So glad to see your honest post. (and rating) So many times I’ve seen bloggers give false positive reviews, because they feel like they have too. I know your readers are going to love your honesty! It is so good to read an honest post on the dermablend I hear so many people raving about it but I’ve never been completely convinced myself. I love your honesty! So many bloggers don’t give honest reviews due to getting paid or free product. This is why you have credibility. It does stink the product didn’t turn out to be amazing 🙁 either way it looks beautiful on you! Your commentary about these products is very helpful. I will use this as one of my make-up/ skin product reference in my future shopping spree. Hmm I’ve never heard of either of these products. After reading your review on them, I’m thankful that I have more information in case I need to use it. Your review about these products is very helpful. I appreciate and admire your honesty. Well I am skittish around make up in general so if I had to mix two types to get the result would be a disaster. Thanks for the honesty. I am all thumbs when it comes to make up! I love to read honest reviews so I can save myself time and money on products I don’t know much about. thanks for a truly honest and in depth review. Very refreshing. I have always wondered if Derma blend really did work. Looks good on your skin. The end result is good, it is great that your friend helped you get the most out of this product. That was a straight forward talk and nice reviews on the products ! I’ve been obsessed with some of their skincare products and now I’m going to check out on their makeup next. The foundation looks so good on you. It seems like theres a lot of mized reviews on dermablend according to the research Ive done. I can never choose a color because it either looks to light or too dark :/ maybe derma blend ahould have like a mixing option or something like that! Thanks for aharing, it sheds some might, i really wanted to order from them! I love that you are honest with your review. Its always hard when shopping for skincare products especially if you are one with different skin needs. Loved this blog! Honest reviews are so refreshing! That color really was almost offensively pasty… I hope the brand can learn something from your review! 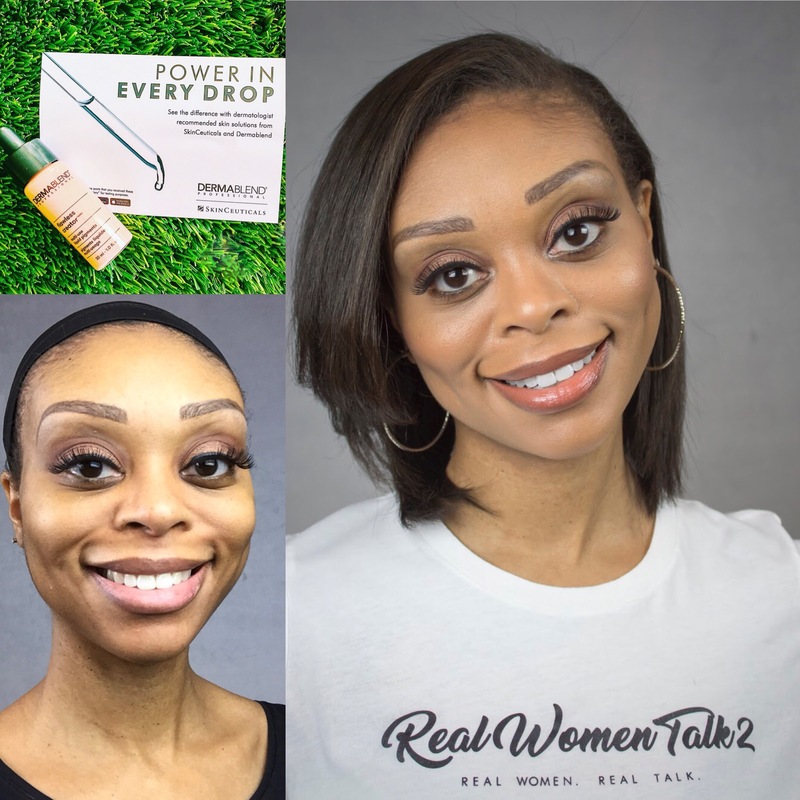 I enjoyed hearing about the serum and cream…First reading the titles of those products had my head spinning…So it was helpful having them explained!